Pearls for nautical wedding are obvious of course, try a statement cuff bracelet like this one, only US$20 from Always the Bridesmaid. Sashes are perfect for that subtle impression of navy style and gorgeous with the addition of crystals and rhinestones. Crystal sash-beaded belt with white ribbon, US$88 from Little White Dresser. 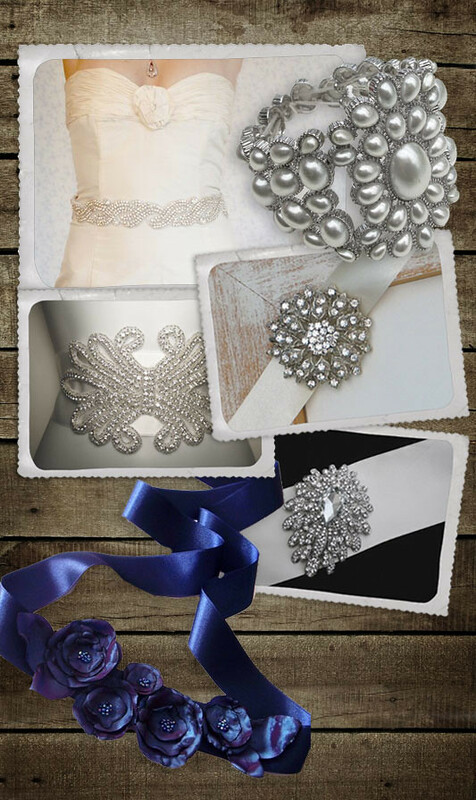 Rhinestone headband or sash with brooch US$38 from Snow White Studio. Swarovski crystal and glass bead sash US$150 from Kirsten Kuehn Designs. Satin sash with crystal brooch US$79 from Powder Blue Bijoux.